Broccoli, cabbage, and cauliflower are all members of the cabbage Family, also known as the Brassicaceae Family and additionally known as “cruciferous” vegetables. There are other members of the Family but here we focus on these three popular and healthy vegetables developed from the wild cabbage. Modern cabbage developed from wild cabbage that originated in Asia and was brought to Europe by nomadic Celts in the 7th century BCE. Cabbage spread throughout northern Europe as a popular crop because it adapted well to cool climates, has a high yield per area planted, and can be stored during winter in cold cellars. Broccoli also derived from wild cabbage but it was bred selectively by the Romans and later Italians. Cauliflower was adapted from wild cabbage by the Italians but it has also been very popular in Turkey. All three of these plants contain healthy compounds that have been implicated in everything from heart health to cancer prevention. they will be a delightful part of your organic patch. manganese and zinc. All of your brassica contain healthy compounds called glucosinolates that are converted into health promoting molecules caied isothiocyanates which have a range of actions that reduce the risk of cancer developing. Broccoli contains high levels of a type of glucosinolate that in your digestive tract is converted to sulphoraphane which enters your bloodstream and has been shown to prevent cell proliferation in the early stage of cancer, reduce inflammation, and stimulate p'oduction of antioxidant enzymes. Sulphoraphane also has an "epigenetic" effect meaning that it affects how your genes are expressed. It can alter processes called “methyiaton’and “histone modiPication" required for gene activation orsilencing in cancer prevention and therapy. Research Prom the journal Arteriosclerosis Thrombosis and Vascular Biobgy has shown that sulphorophane activates a protein called Nrf2, which is involved in keeping blood Plowing in arterial areas where it may become clogges. This is very good news for your heart. Cabbage is a good source of vitamin C and vitamin A. It is also supplies good levels ofantioxidant polyphenols. White cabbage provides about 50 milligrams of polyphenols in a half-cup serving while red cabbage yields 30 milligrams of the red pigment polyphenols called anthocyanhs in each half cup. Cabbage, like broccoli, containsglucosnolates, which ore made into isothiocyanates that protect against cancer through a variety of different mechanisms. In some cases, they help to regulate inflammation by altering the activity of messaging molecules within your body's inflammatory system. In other cases, they improve detoxification system and leave our cells with a smaller toxic load. The bottom line is that consumption of cabbage leads to a decreased risk of cancer. Cauliflower is also an excellent source of vitamin C, vitamin K, and folate. It is a very good source of vitamin RS. potassium, dietary Rare, manganese and molybdenum. Additionally, it is a good source of protein, phosphorus, magnesium, vitamin B1, vitamin B2, vitamin B3 and iron. Like all brassica, it is an excellent source oh fiber. Cauliflower does contain glucosinolates but only 50 per cent as much as cabbage and 60 per cent of what is found in broccoli. Nevertheless, there is evidence that eating cauliflower helps lower your risk of developing cancer. There is also research showing that cauliflower reduces inflammation and heart disease risk. The general antioxidant and fiber content of broccoli, cabbage and cauliflower mean that they all support the detoxification processes within your body. To get the maximum health benefits of your brassica crops you need to consume about half a cup each per day which is no hardship given how delicious they can be end the variety of ways in which you can prepare them. The evidence is that the best way to eat your brassica is steamed. For instance, the fiber in broccoli binds with bile acids more effectively m your digestive tract when the broccoli has been steamed. When this binding process Lakes place, it’s easier for bile acids to be excreted, and the result is a lowering of your cholesterol levels. Raw broccoli still has cholesterol-lowering ability, just not as much. Cabbage is often prepared in long-form recipes where the cabbage is cooked for considerable time in a stewing process. The evidence is that the isothiocyanates do not survive this well and you are best to either eat your cabbage raw or steamed. When to plant: Sow seed direct, or into seedling trays and transplant. Sow broccoli in late summer to spring in cooler regions; and opt for dryer times in the northern zones. Plant cabbages according to variety, but avoid hottest months in cooler regions; and similar to broccoli in warmer climates. For cauliflower miss the coolest months in cool and temperate regions; but autumn or winter where it’s warmer. Climate: Grows in most areas of Australia, some varieties all-year-round. Plant according to varieties and regions. 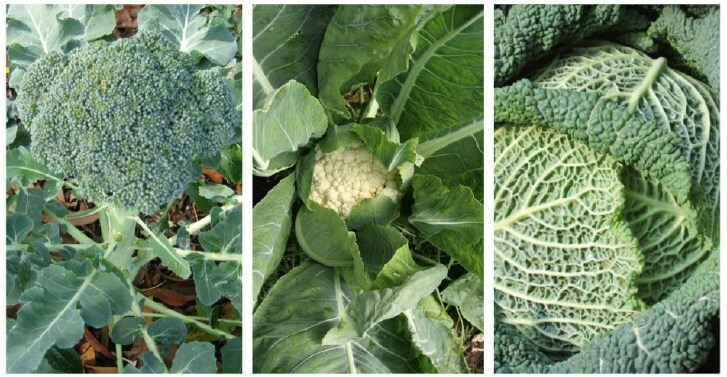 Specific needs: All brassicas like rich, well-drained, but slightly alkaline soil. Before planting prepare with plenty of well-rotted manure. Water regularly to avoid stress. Fertilize with seaweed based fertilizer. Mulch well with pea straw or lucerne to retain moisture and insulate roots. Can be grown in pots. Companion planting: Plant cabbages with peas and lettuces; while broccoli and cauliflower suit onions. Harvesting: Pick the large central broccoli head at the base; side shoots will continue forming so keep picking. Don’t allow broccoli to flower because that will stop production of new shoots. For whiter cauliflower heads cover with the side leaves and harvest when head is tight. Cut low down on the stem. Cabbages can be picked when they heart, just cut as far down the stem as possible.